Hit the street and clean up all of the dogs that are running rampant! Click here to play! If you can capture these mutts you'll definitely spin in a few bones! Your main aim is to bring in the pooches, the main one being the street tough bulldog. 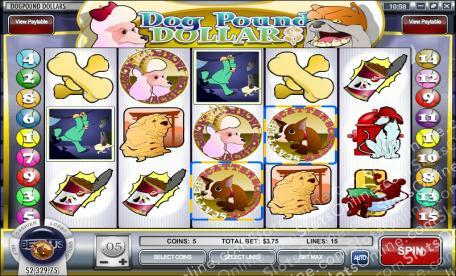 This robust doggie is a wild symbol and will substitute for most other symbols to help you create winning combinations. Also, if you spin two to five of these you will get up to 10000 times your original line bet. You'll also want to watch out for Dobermans, St Bernards, Dalmatians, Shar Peis and Dachshunds. Other things that will lead you to the canines include tennis balls, bones, the dogcatcher and dog food. You'll want to keep a close eye out for Chihuahuas. These tiny pups act as a scatter symbol. If you spin three or more of these anywhere on the board, you will win 15 free spins in which prizes are tripled. Hit the streets in search of rampant dogs for a chance to catch plenty of cash prizes! The tiny Chihuahuas act as a scatter symbol. If you spin three or more of these anywhere on the board you will win 15 free spins. Prizes are tripled during free spins. The bulldog acts as a wild symbol. They will replace all other symbols except scatters. They will double prizes if they appear in winning combinations. If you spin two to five you will multiply your line bet by 10, 200, 2000 or 10000 respectively.